US Congressman, Bruce Morrison will visit Ireland next week where he will address members of the Oireachtas on proposals to resolve the huge issue of undocumented Irish in the US. Fianna Fáil Senator Mark Daly, who has organised the visit, said the issue of undocumented Irish is going to be given huge prominence in the US over the coming months. “There are as many as 50,000 undocumented Irish living in the US at the moment, with the economic circumstances we have here, people feel they can’t go home and in many cases are stuck in limbo,” said Senator Daly. “These are hard-working people who went out to America to seek a better life; some have been there over 20 years and they have families, children and even great-grandchildren. It is tragic that 50,000 Irish people can’t go home to see their loved ones for weddings, birthdays and family occasions. “The vast majority of the undocumented Irish would love to become legally recognised in the US. They hold down good jobs and contribute handsomely to the American economy. There have been many attempts over the last number of years to formulate legislation to offer an amnesty for undocumented workers but each time this was voted down. 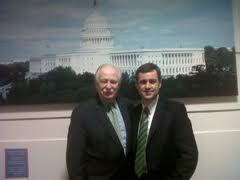 “One of the most prominent advocates of the undocumented Irish has been former Congressman Bruce Morrison. He is famous for the Morrison Visa initiative which offered 40,000 green cards to non-Americans in the 1980s. “This week’s US Presidential election has made members within the Republican Party reconsider their stance towards undocumented workers. Hopefully a compromise can be reached to finally offer an amnesty for the 50,000 Irish in America who are undocumented.